A cars wheels can spin and lose traction for various reasons. This can be due to wet, slippery or icy roads, defective tyres, traction control is defective or turned off or simply that a driver likes wheelspin. Wheelspin can potentially be dangerous and if done intentionally on a dry surface, puts extreme load on the cars affected components, possibly leading to costly repairs. This section explains how to wheelspin, drop the clutch, how to prevent wheel spin and the potential dangers and problems associated with a cars wheelspin. It’s important to understand how to wheelspin a car in order to prevent it. Wheelspin is easy to accomplish. Whilst stationary, ensure the clutch is pressed down, the hand brake is released and the car is in 1st gear. The usual amount of revs for moving off safely is around 1500 rpm, for wheel spin to occur, significantly higher revs are needed. Not providing the engine with enough revolutions (power) will result in an engine stall. The higher the revs, the more wheel spin, just ensure you keep an eye on the rev counter to make sure you do not go into the red as engine damage may occur. Once you have set high revs, release the clutch fully and quickly. It’s important that the clutch is released fully and quickly as a significant amount of clutch burn and wear will occur due to the high engine revolutions. The instant release of the clutch causes all of the engine power to be instantly distributed to the wheels unlike when slipping the clutch which transfers some of the engine power to be released through friction by the clutch plate and flywheel slipping. This instant clutch release technique is also known as dropping the clutch and can cause significant wear to tyres and a high level of strain on the transmission. 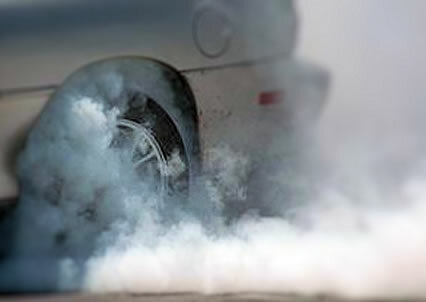 These tyre burnouts may look impressive to some, but if a car is of a certain age where components are already worn and degraded due to use and age, wheel spinning and dropping the clutch can cause fatal damage to a vehicles components. Dropping, popping and dumping the clutch are all terms used for this technique and whilst for many cars this form of manoeuvring could result in mechanical failure, vehicles that are up to the job and drivers that are skilled in this area use a type of clutch feathering technique that reduces harmful loads to components whilst maximising power to the wheels. To achieve wheelspin, we established that a high level of revs are needed with a combination of a quick release of the clutch. Wheels can be prevented from spinning by a combination of limited revs (around 1500 rpm) and clutch control. It’s important to have a good understanding of clutch control and to raise the clutch to the biting point. The clutch can be raised as quickly as you wish until the bite point. At the bite point, the clutch needs to be raised extremely slowly until the car is moving and has full traction. Continuously raising the clutch too quickly through the biting point is what results in either stalling the car or wheelspin. Once the car is moving and has complete traction, the clutch can be fully released. If the cars wheels are already spinning, briskly depressing the clutch all the way to the floor will cancel wheelspin. Once the clutch has been pressed, apply the foot brake immediately to gain full control. Modern electronic traction control in cars helps to prevent wheelspin, especially in muddy, wet or icy conditions. Ensure traction control is turned on if available. Of course ensuring your tyres are well within the legal tyre tread depth of 1.6 mm around the entire 3/4 breadth of the circumference of the tyre will aid in gaining better traction on road surfaces. Whilst attempting to move off, try to keep the clutch positioned in the bite point area and if the wheels spin, press the clutch just a small fraction to cancel the spin and begin gently lifting again to regain traction. Unintentional wheelspin can be dangerous if pulling out of a busy junction or roundabout because a lack of movement may put the car in a dangerous position for oncoming vehicles. Wheelspin on rear wheel drive vehicles can be dangerous as the rear of the car can swing sideways and lose control. This does not happen on front wheel drive vehicles. Technically it’s not illegal to wheelspin although if done in an area that could be hazardous to pedestrians or other road users it could be considered as careless driving by police. Careless driving will lead to points on a drivers licence and a fine. Wheelspin on a dry surface puts extreme load on various components of the car. Excessive revving may damage the engine. The clutch is put under heavy load as is the gearbox. Wheelspin isn’t likely to cause too much damage if done rarely, although if a component is already weak, it is much more likely to fail. All the components affected are expensive to replace and the tyres life span is of course significantly shortened.